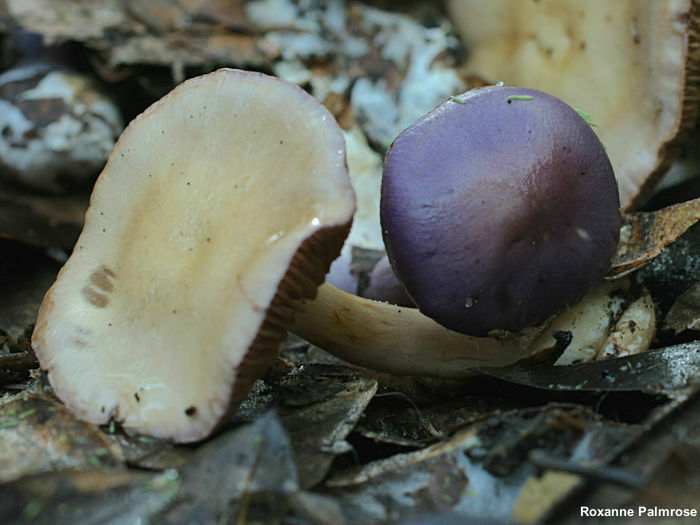 Here is a beautiful species of Cortinarius from eastern North America's oak forests. 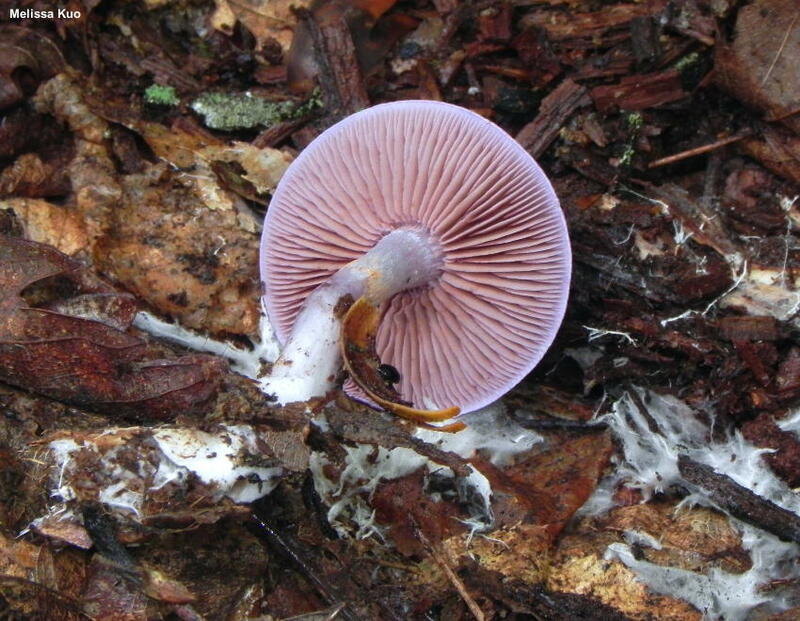 It features a slimy cap and stem, and its purple to lavender or lilac colors become spotted with yellowish to tan areas—eventually fading to dull grayish tan overall. 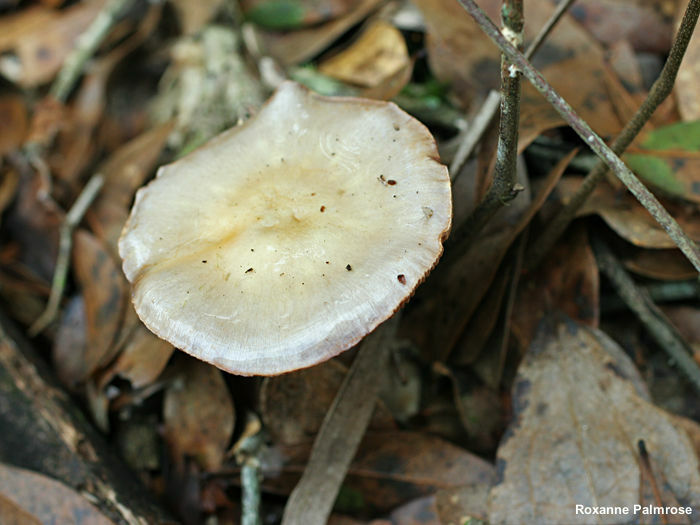 Like other species in the genus, it features a cortina and a rusty brown spore print. 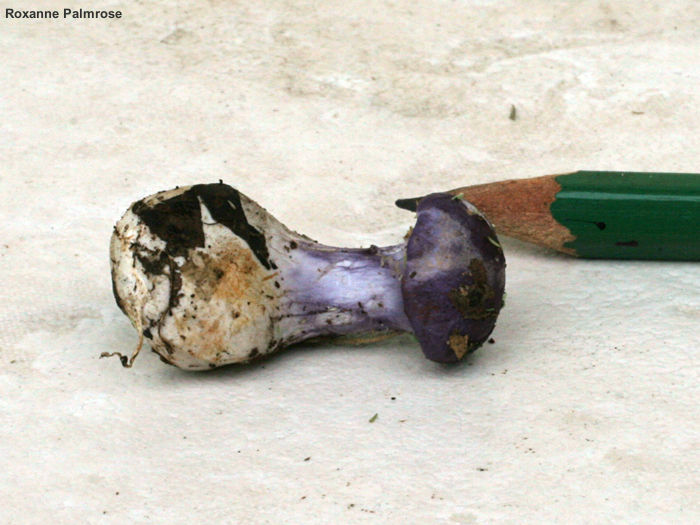 Cortinarius iodeoides looks identical to the naked eye, and also appears under hardwoods. It is ostensibly different in that the slime on its cap surface tastes bitter, rather than mild—but I don't recommend licking the slime on unknown mushrooms; the two species are more reliably separated on the basis of their differing spore sizes. 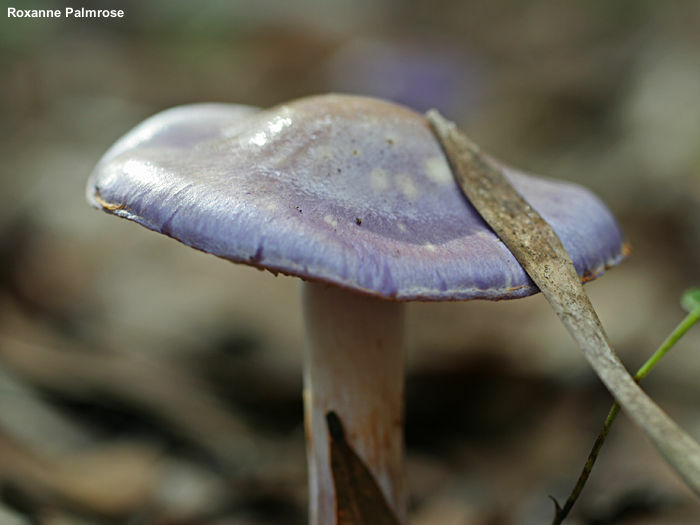 Cortinarius heliotropicus, named by Peck in 1905, is another name for the same species (Ammirati & Bigelow, 1984); however, since Cortinarius iodes is the older name (applied by Berkeley & Curtis in 1853), it takes precedence. Thanks to Roxanne Palmrose for collecting, documenting, and preserving some of the illustrated and described specimens; her collection is deposited in The Herbarium of Michael Kuo. Ecology: Mycorrhizal with oaks; growing alone or gregariously; summer and fall, or over winter along the Gulf Coast; widely distributed in North America east of the Great Plains. The illustrated and described collections are from Ohio, Pennsylvania, Québec, and Florida. Cap: 3–6 cm; convex, becoming broadly convex or broadly bell-shaped; slimy when fresh; bald; purple to deep lilac when young, developing yellowish to brownish spots, especially near the center, and eventually fading to yellowish tan or grayish tan; the margin not lined. 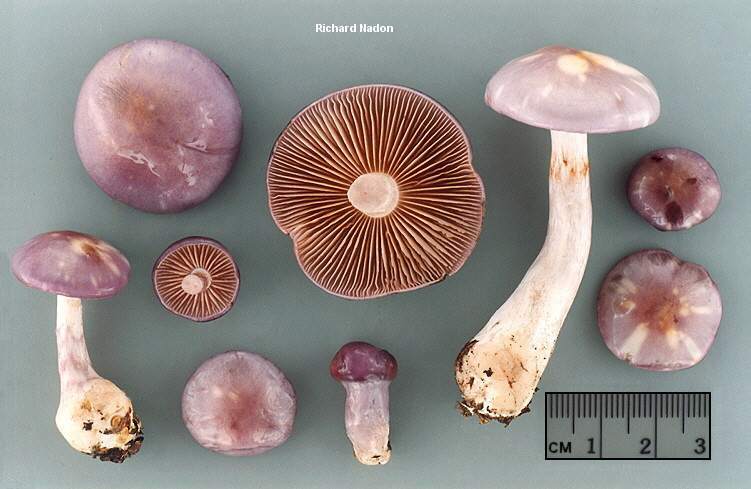 Gills: Attached to the stem; close or nearly distant; pale purple to dull lilac, becoming cinnamon to rusty brown; short-gills frequent; covered by a thin cortina when young. 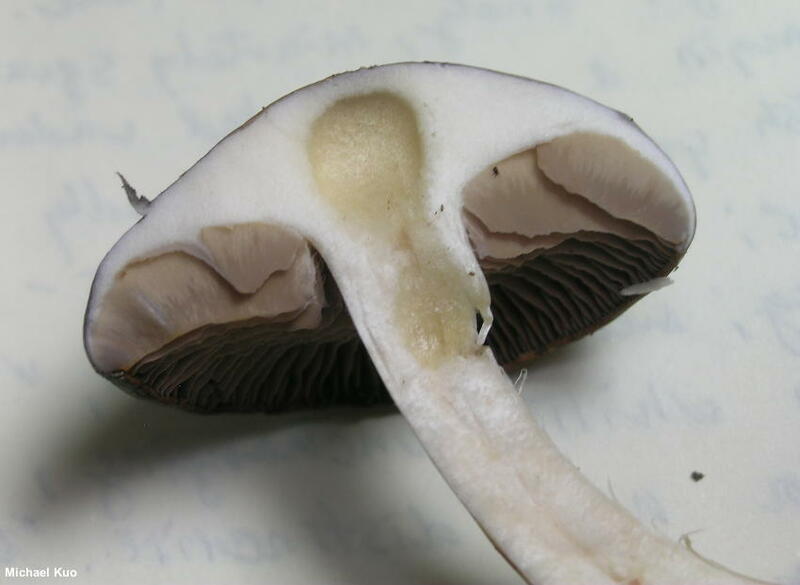 Stem: 3–6 cm long; 0.5–1 cm thick; club-shaped when young, becoming more equal with maturity; slimy; whitish to purplish or silvery lilac; often with a rusty ring zone; basal mycelium white and copious. Flesh: Whitish to pale lilac; soft; unchanging when sliced. Odor and Taste: Taste of cap slime (sorry) not distinctive, or slightly acetic—but not strongly bitter (see discussion above). Odor not distinctive. 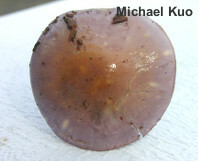 Chemical Reactions: KOH negative to pinkish on cap surface; brownish on flesh. 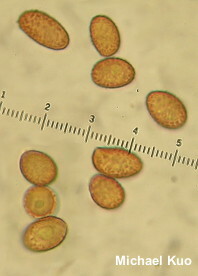 Microscopic Features: Spores 8–12 x 5–7 µm; ellipsoid, often with one slightly constricted end; finely verrucose; orangish brown to reddish brown in KOH. Hymenial cystidia absent. 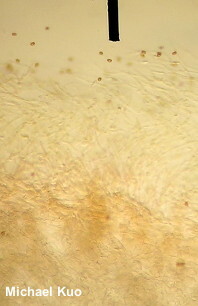 Pileipellis an ixolattice; elements 2.5–4 µm wide, clamped at septa, smooth, hyaline in KOH. REFERENCES: Berkeley & M. A. Curtis, 1853. (Saccardo, 1887; Kauffman, 1918; Kauffman, 1932; Smith, Smith & Weber, 1979; Ammirati & Bigelow, 1984; Arora, 1986; Phillips, 1991/2005; Lincoff, 1992; Metzler & Metzler, 1992; Barron, 1999; Roody, 2003; McNeil, 2006; Miller & Miller, 2006; Binion et al., 2008.) Herb. Kuo 07201404, 07181505, 12101505.